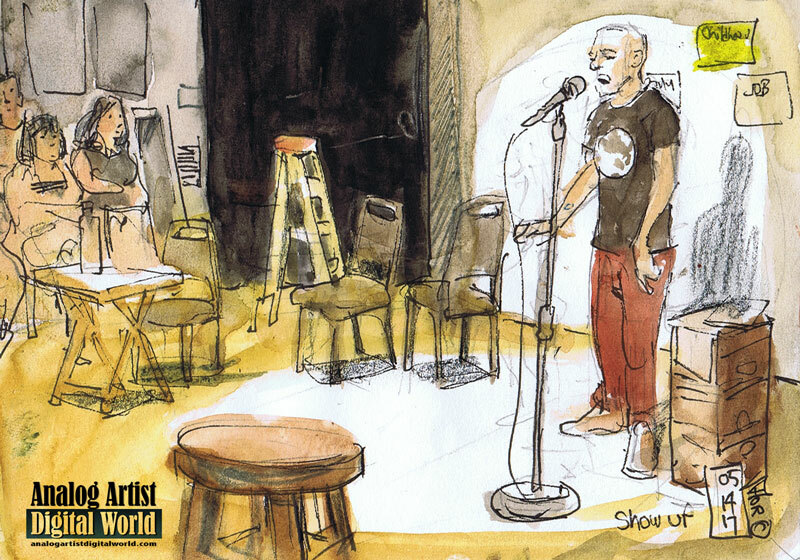 Analog Artist Digital World: Show Up at Fringe. Pete Michael Marino from New York City, grew tired of seeing solo Fringe shows about a person's life. He decided to instead create a show built around the lives of members of his audience. He pointed out a quote by Woody Allen that said "Showing up is 80 percent of life. Sometimes it’s easier to hide home in bed. I’ve done both." Since we had shown up for his show, he felt we were all 80% of the way towards an amazing and entertaining show. Pete picked out a cute young woman from the audience and he dubbed her his stage manager. Her job became to reorganize the chairs and table for each scene. On the back wall of the theater there were large post it notes that were used to define the basic structure for the stories to follow. The audience was asked questions that then became the underlying structure for each scene. Pete confided that he had been diagnosed with an early case of Alzheimer's.... by his friends. He therefor was fine with staying "on Book" referring to loose notes he had scribbled on a sheet of paper. Much of each scene however was pure long form improvisation and he flew by the seat of his pants. According to him, he had no idea what he was doing which added to the allure that the show could potentially self destruct at any moment. He managed to keep the show light and entertaining despite the challenges. After the last scene he divided up the audience into sections and invited us all to mingle on the stage for a party. I was assigned to serve imaginary drinks which I did with gusto. Once everyone had imaginary drinks in hand they felt comfortable to mingle and mix on the stage. A string of Christmas lights was unfurled among the party goers. It was certainly a fun and unexpected way to end the show.